Last year, we visited Shenandoah National Park in November, chasing the fall colors. This year, I traveled solo to Asheville, North Carolina. Armed with my camera and tripod, I wanted to capture the brilliant fall colors in the area as well as spend some time photographing waterfalls. I arrived in Asheville at the very beginning of November. In some places, the falls colors were brilliant, and at others, the leaves were way past peak, with some areas completely bare. Even so, this was a great time to visit Asheville. The area was experiencing above average temperatures (into the mid-70’s during the daytime) with a healthy mix of sun and clouds. 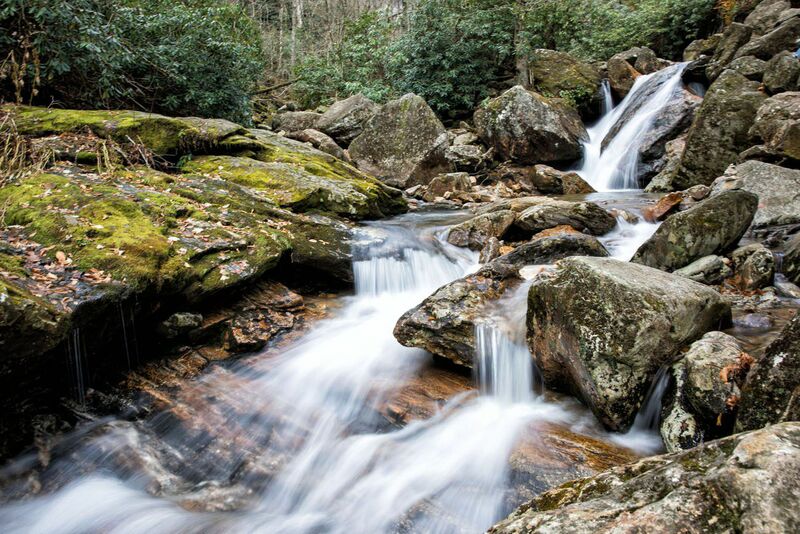 While in Asheville, I drove part of the Blue Ridge Parkway and hiked to several small waterfalls. If you are not familiar with the area, there are dozens of waterfalls to visit, some right off of the main roads and others just a short hike through the woods. 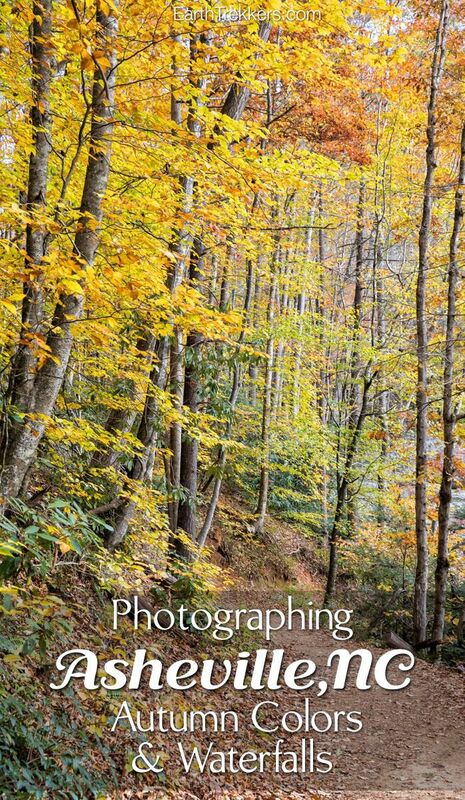 Here are the highlights of my day, driving the Blue Ridge Parkway and photographing waterfalls and autumn colors around Asheville. I started 45-minutes southwest of Asheville, in Pisgah National Forest. 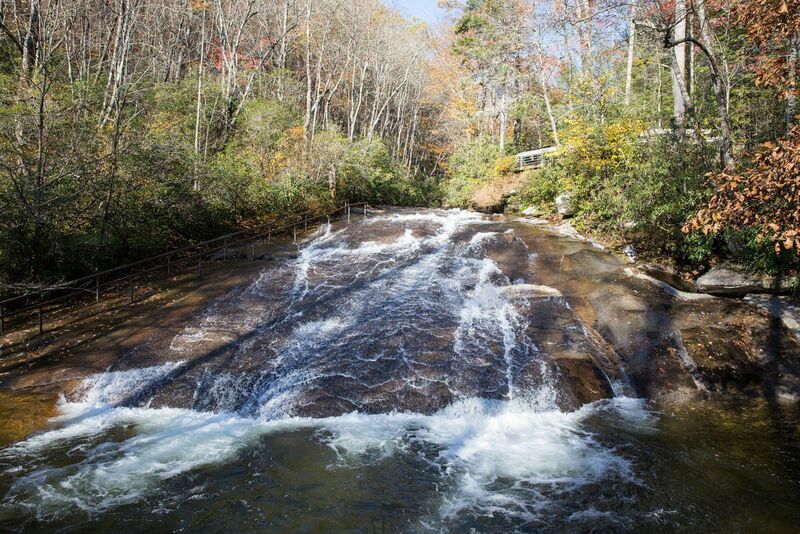 Just off of highway 276 is Looking Glass Falls, an easy spot to visit because you can view the falls right from the road. However, take the steps down to river’s edge and you get a better view of the waterfall. 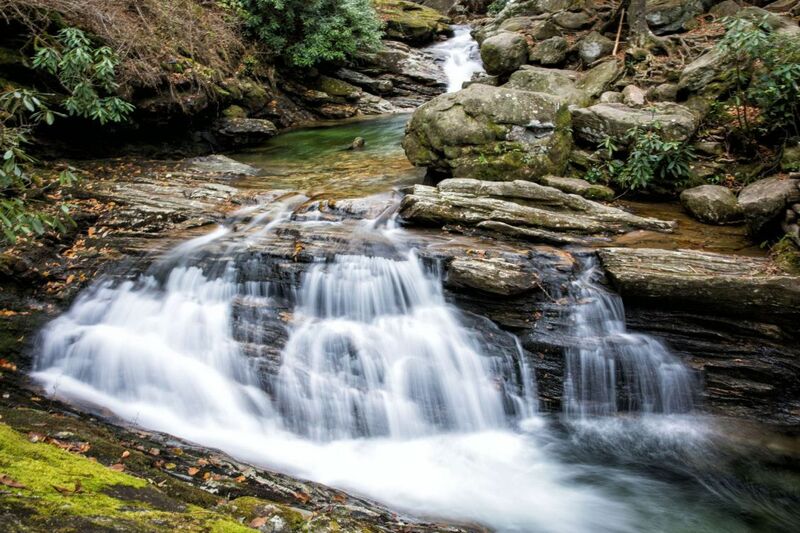 From Looking Glass Falls, it is just a few minutes drive to the Moore Cove Falls trailhead. This next waterfall required a little hiking (1.2 miles round trip), but the trail is mostly flat and easy to hike. Several miles north of the Moore Cove Falls trailhead is Sliding Rock. This waterfall is a popular summer destination. Think waterfall + sliding board combo. On a hot day, Sliding Rock draws lots of visitors, for a fun slip and slide 60 feet down the falls into the cool pool of water. However, in November, the crowds are gone and it’s a quiet place to visit. Sliding Rock is open from Memorial Day through October. The entrance fee is $2.00 per person and yes, kids can do this. If you continue north on highway 276 towards the Blue Ridge Parkway, it’s a slow and steady climb. 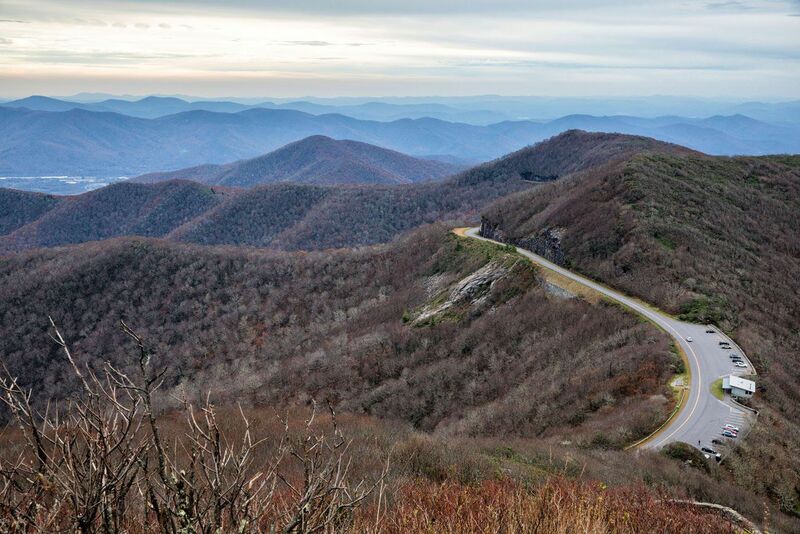 Turn left to head south on the Blue Ridge Parkway for several fantastic overlooks. Now, the road is over 4,000 feet in elevation and the views over the rolling mountains are stunning. 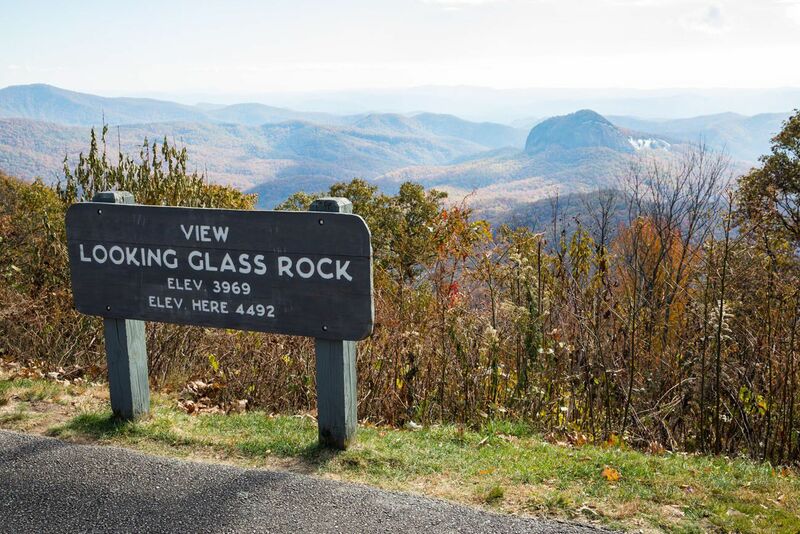 One of the best views is out to Looking Glass Rock. This almost completely bare monolith looks out of place among the rolling mountains in the area. 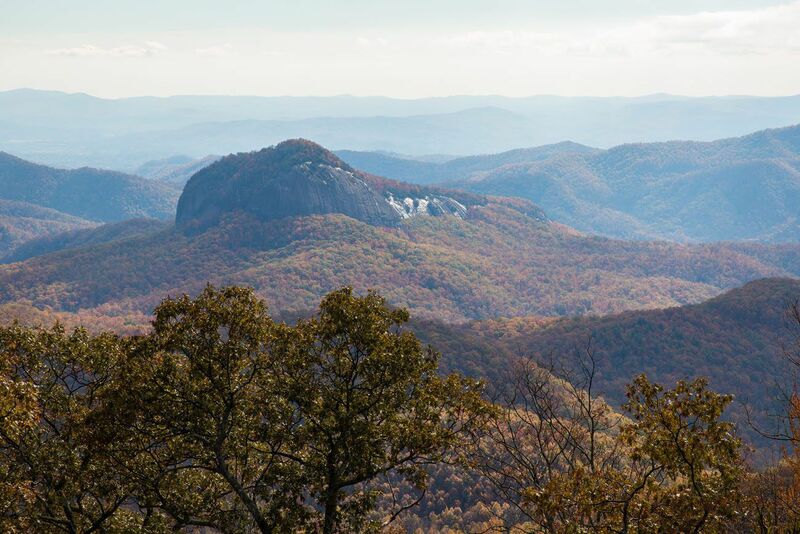 You can hike up to the top of Looking Glass Rock. It’s a strenuous hike, 6.5 miles round trip and takes 4 to 5 hours. Click here to learn more about the hike. Skinny Dip Falls is a series of small waterfalls that cascade into pools of water, making this a great spot to cool off in during the hot summer days. The header photo for this post was also taken at Skinny Dip Falls. To get here, park at the Looking Glass Overlook. The trailhead is located next to the 417 mile post. There is no signage here but the trail to the waterfall is easy to follow and not too difficult to hike (0.8 miles roundtrip). 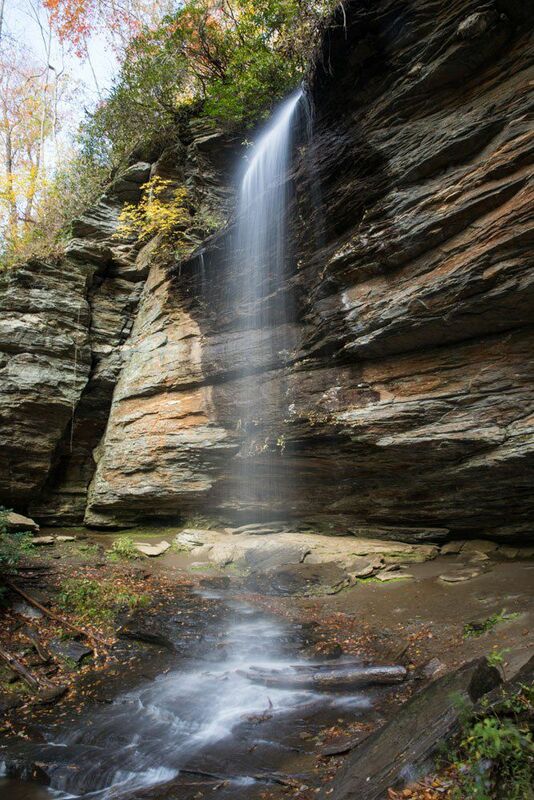 From Skinny Dip Falls I drove east to Catawba Falls. 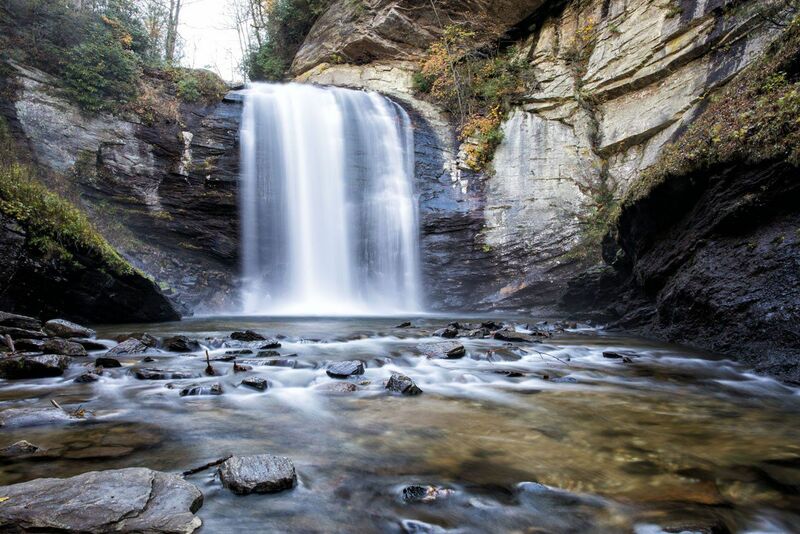 This is a spectacular waterfall located 30 minutes east of Asheville, almost right off of Route 40. 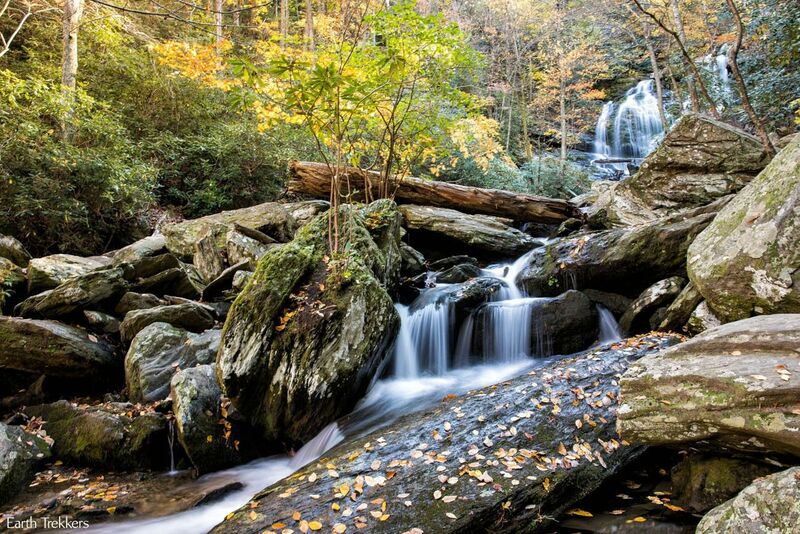 To get here, it’s a relatively easy 3-mile round trip hike through the forest along the Catawba River. Catawba Falls was the largest waterfall I visited all day. It was also my favorite. Now that I was at a lower elevation than on the Blue Ridge Parkway, there was more fall color here. Plus, these falls are beautiful, with several series of large and small waterfalls and unique views of the river. On a separate day, I drove up the Blue Ridge Parkway to Craggy Gardens. If you want to see the rolling mountains near Asheville, this is a great spot to visit. 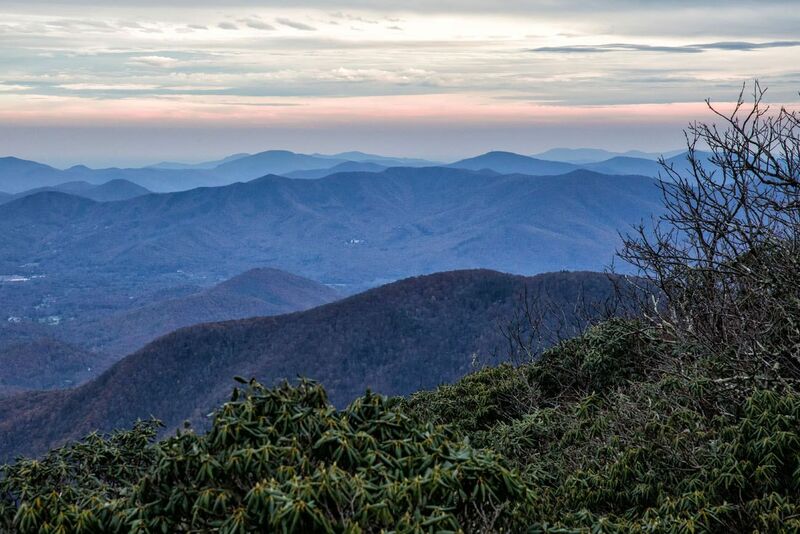 From Craggy Pinnacle, you have 360° views of the mountains. During my visit, it was overcast and windy. Temperatures were in the high 40’s and the wind made it feel even colder. The temperatures on Craggy Pinnacle can be 10 to 20 degrees colder than in Asheville, so bring warm clothing! To get to Craggy Pinnacle, it is a 1.4 mile round trip hike to the summit (5,892 feet) from the Craggy Dome parking lot. 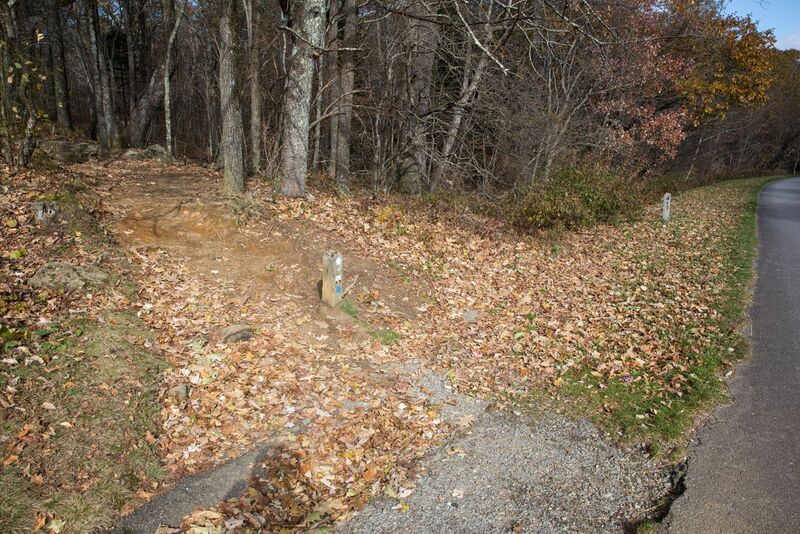 The trail is lined with rhododendrons and would be gorgeous in the spring when they are blooming. I also hiked up to the Craggy Gardens picnic area, which is not nearly as scenic as the hike up to Craggy Pinnacle. 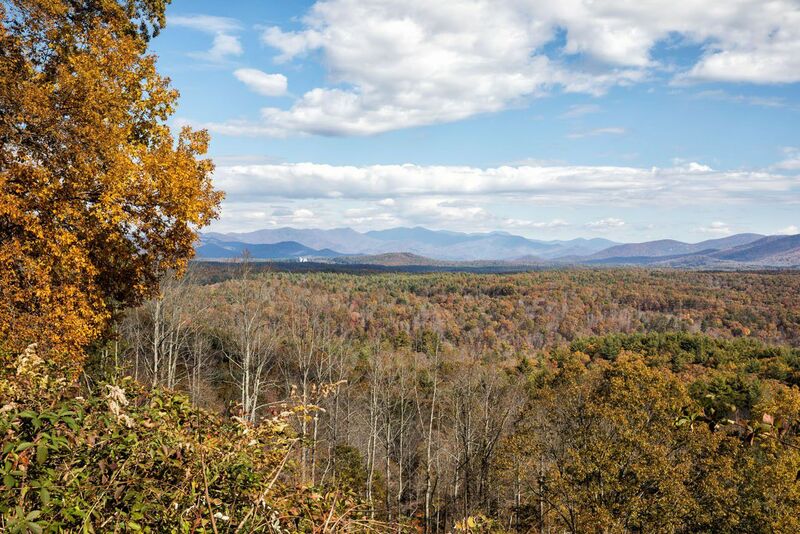 You have a lot of great options to get outdoors when visiting Asheville. During my short stay I couldn’t get to all of them. I wish that I had made it to these, too, because they look and sound wonderful! I was really bummed I couldn’t visit Chimney Rock. It closed the week before my visit when rainshowers washed away part of the parking lot. 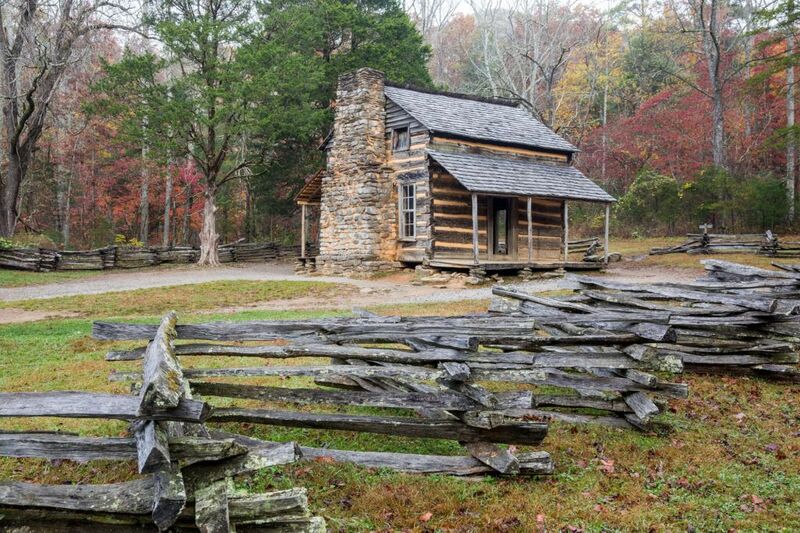 This is a very popular spot to visit, located 25 miles (45 minutes) east of Asheville. Chimney Rock is a granite monolith, a recognizable icon of the area. Tickets cost $13 for adults and $6 for children. 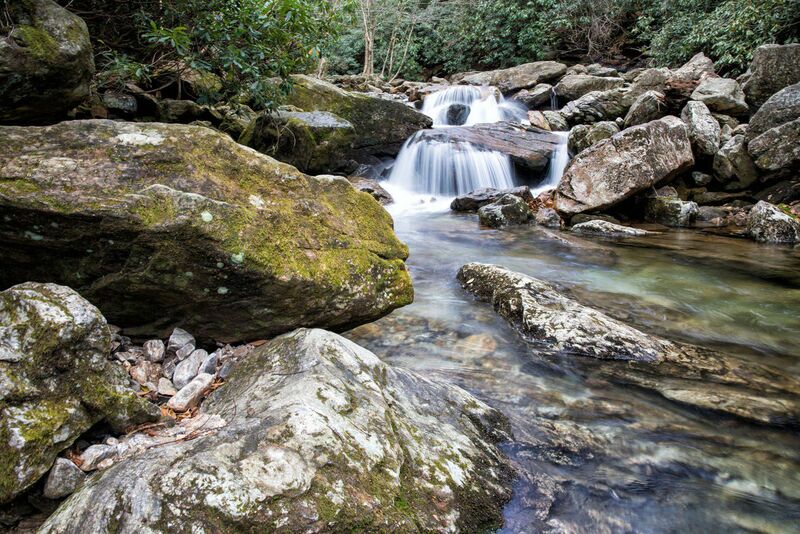 This recreational area is located south of Asheville and contains over 10,000 acres of forest, hiking trails, and waterfalls. It is also famous for being a Hunger Games filming location. Both Triple Falls and Bridal Veil Falls were featured in the movie series. Want to see more waterfalls? 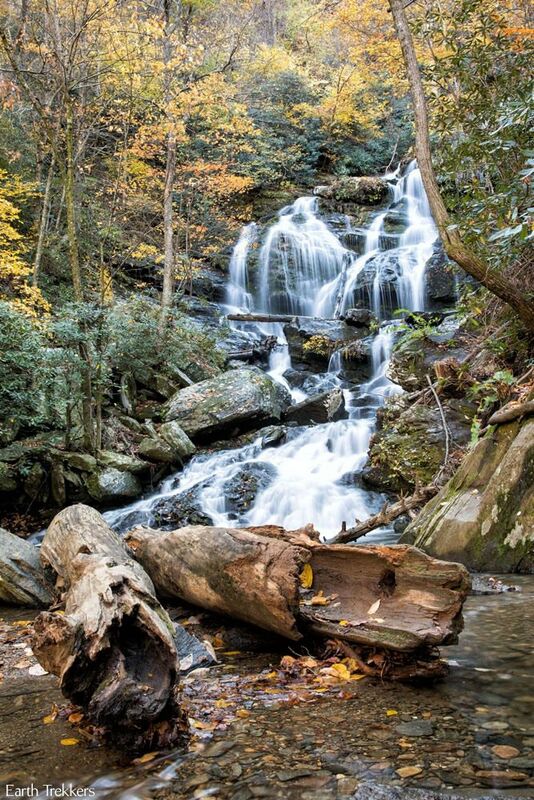 There are plenty more waterfalls just waiting to be explored around Asheville. 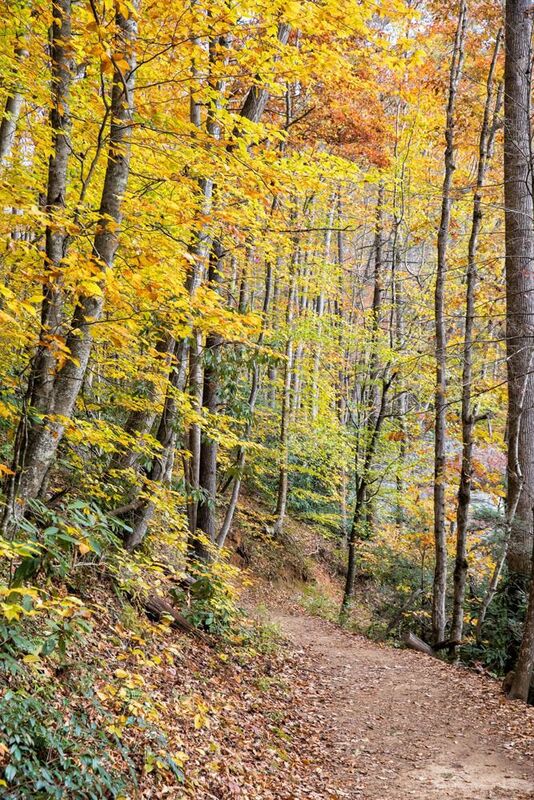 To learn more, visit the Asheville Trails website. Located just outside of Asheville is the Biltmore Estate. 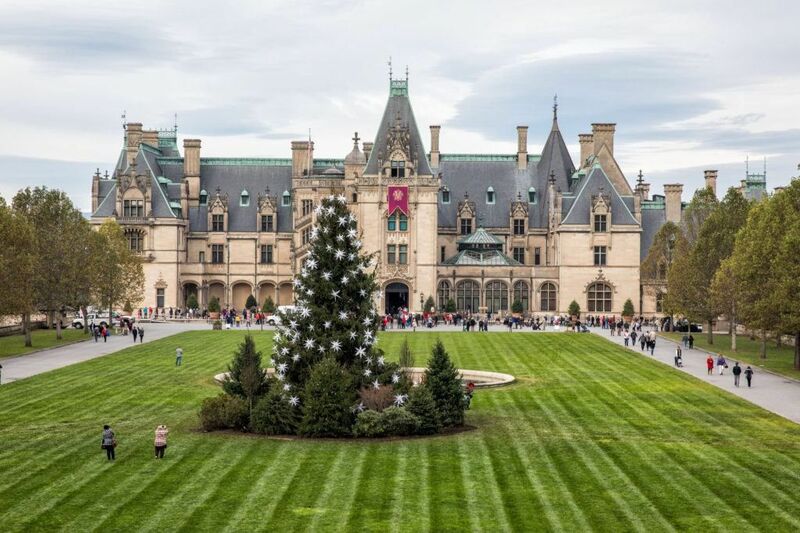 Visiting the Biltmore is a must-do activity on a visit to Asheville, even with it’s hefty price tag of $65 for adults and $32.50 for kids. The Biltmore is a beautiful spot to visit, and there’s more to it than just touring a opulent mansion. 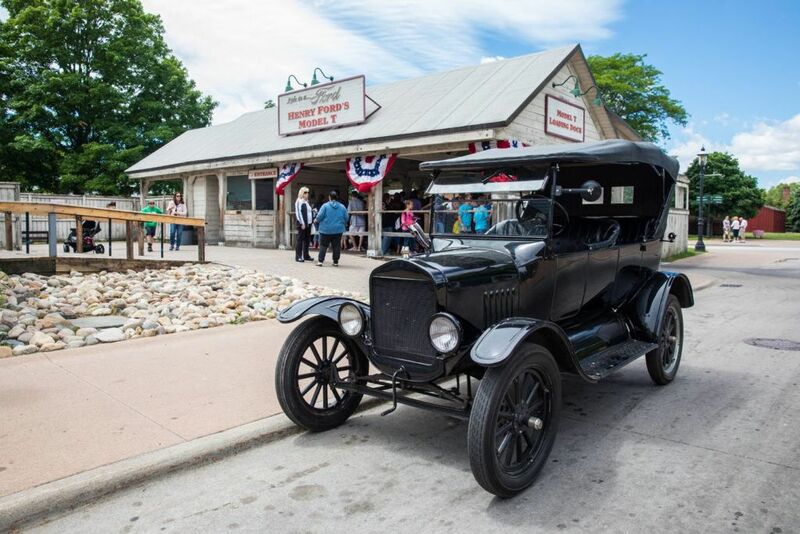 Go hiking, horseback riding, visit the Biltmore Winery, have lunch or dinner, and go shopping. Some people spend all day here. Here is the view of the estate from the Blue Ridge Parkway. 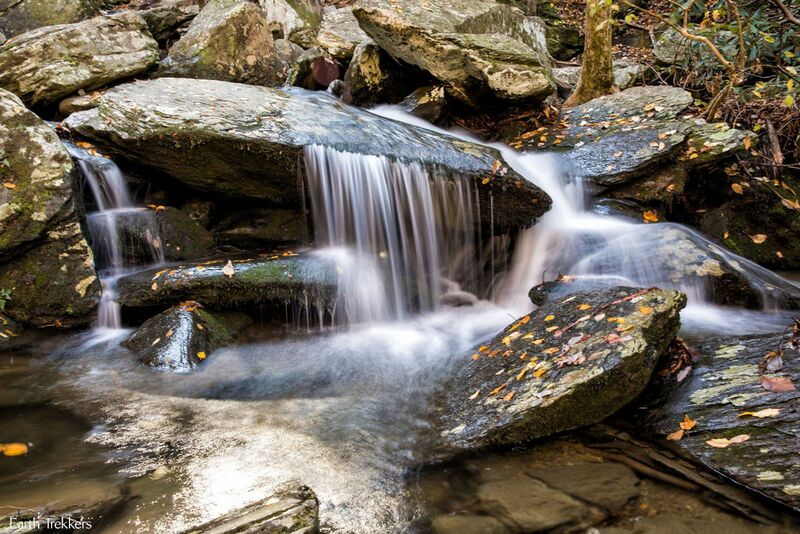 To capture the blur of the moving water, you will need a tripod. On a bright day, having a neutral density filter or polarizing filter is also beneficial. For these photos, I used a B + W ND 0.6-4X (102) neutral density filter. A neutral density filter is like putting sunglasses on your camera. It darkens the scene you are photographing, allowing you to shoot with a slower shutter speed. To create the frozen waterfall effect, shoot in manual mode. I set the ISO to 100 and experiment with shutter speeds from 0.5 seconds to 2 seconds (adjusting the aperture for proper exposure). How long you choose to leave the shutter opens depends on the amount of light available and what kind of effect you want to produce with the water flow. Longer shutter speeds result in a very blurry, frozen effect whereas shorter shutter speeds can still blur the water but preserve a little bit of the detail. I recommend experimenting with a few different shutter speeds and pick your favorites later when viewing them on your computer. Instead of using a neutral density filter, you can use a polarizing filter. 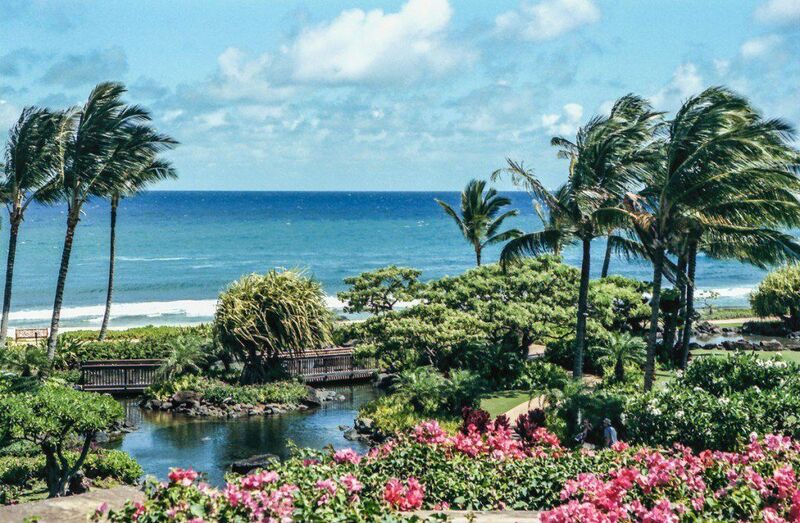 Polarizing filters reduce the glare on the water and can make your colors more vibrant. I also recommend wearing waterproof hiking shoes. To get several of these shots, I had to walk through shallow water and over slippery rocks to get to the best vantage points. Want to learn more about the gear we use? Check out our Travel Photography Gear Guide. Have you been to Asheville, NC? What is your favorite outdoor adventure? just ran across your blog on pintrest looking at south america trips and stubbled on your post about Asheville. I have lived here for two and a half years, currently live in chimney rock now (hate you didnt get to see it, we have had some crazy weather) but made my day to see someone embrace and love my city as much as I do. So glad you enjoyed. come back anytime. PS- catawba is my favorite- first one i hiked out here. it is my happy place!